Available within a 20-mile radius of Bloomfield, CT. Other arrangements are available on request. The majority of our customers are located in Connecticut and Massachusetts. We also currently service the specialized needs of customers located in Pennsylvania, Virginia, Maryland, Ohio, Florida, and Kentucky. With over 40 years of experience, Aqua Blasting offers an extensive range of surface enhancement services to meet the needs of our aerospace, commercial, industrial, and architectural customers. Our equipment includes automated peening and media blasting equipment along with a highly skilled staff trained to work with aerospace and commercial standards and specifications. Our facility features several large abrasive blasting rooms, giving us the ability to handle very large industrial and architectural parts up to twenty feet in length. Stringent aerospace quality system requirements like Nadcap AC7004 require continuous audited inspection and surface finish testing to ensure the integrity of both products and processes. Following aerospace shot peening metallurgy practices, we measure the intensity and roughness, and surface finish requirements of all our surface treatments. Inspection and testing equipment such as surface profilometers and microscopes are also used as part of the quality assurance process. Centuries ago, metal workers began using ball peen hammers to cold work steel and improve its strength. Over time, this technique evolved into shot peening, an advanced cold working process that improves product performance, increases the fatigue strength and resistance to stress-corrosion cracking in metals. Using round metallic, glass, or ceramic shot, shot peening relies on the plasticity of metal to modify the surface layer’s mechanical properties. During the shot peening process, we control and measure critical parameters such as intensity and coverage. This surface treatment technology is widely used in the aerospace, automotive, medical, alternative energy, defense and commercial industries to reduce component failure rates and increase the life span of parts. A variant of shot peening, this technique uses lead-free soda lime glass beads to produce a clean, bright satin finish on metal. This process has multiple uses, including polishing, honing, peening, blending, cleaning, and light debarring. Glass beads are environmentally friendly and can be recycled numerous times. The process of glass bead peening creates a uniform surface layer of compressed stress in metal alloys, helping to resist corrosion and stress cracks. This process uses water in conjunction with fine or coarse media to clean and apply a surface texture to metal. Using water rather than air as the media transport mechanism, wet abrasive blasting simultaneously degreases and blasts the part. Water also creates a lubricating cushion that protects both the media and part from excessive wear or breakdown. Higher levels of cleanliness can be achieved with wet abrasive blasting as static cling is eliminated and surface recontamination is reduced. Originally developed in the late 1800's, dry abrasive blasting uses high pressure air in combination with an abrasive media to smooth rough surfaces, texture smooth surfaces, and remove surface contaminants. 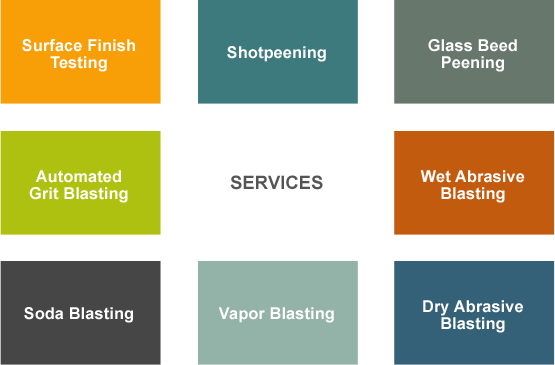 This process is widely used for pretreatment for coating and cosmetic blasting. Various types of media can be used with this process, including minerals, agricultural products, ceramics, and plastics. Most media can be reused multiple times. For restoration work, dry abrasive blasting is also used to remove old surfaces such as paint, plating, and coatings. This process can be used on either a singular part or a batch process. Vapor blasting the ideal surface treatment for softer metals like aluminum as it cleans and polishes without damaging or pitting the metal substrate. No toxic or volatile chemicals are used in this process, only glass beads, water, and a small amount of detergent. Vapor blasting has a mild peening effect on metal, resulting in a durable surface that is harder and more stain resistant. This process can be used on a either a singular part or a batch process. Widely used in a variety of commercial and industrial applications, soda blasting uses high-pressure compressed air and sodium bicarbonate to clean and restore surfaces. As a blasting medium, Sodium Bicarbonate is non-toxic, environmentally friendly, and FDA approved. Due to the softness of the soda blast media, it cleans and degreases surfaces without damaging the substrate material. Soda blasting can also be safely used on hard-anodized surfaces without harming the original finish. Automated grit blasting is used to produce a specified profile and uniform roughness for metal parts such as bolts, extractors, pins, and uppers. The process of automation ensures that the entire target surface is treated with a high degree of uniformity and repeatability. This creates a highly desirable uniform finish after anodizing.